It is very important for humans to eat in order to keep on living healthily and so refrigerators are also very important to store up our food items. For this reason, refrigerators must always be kept clean and organized. The last thing anyone should have to do is eat from a messy fridge. Germs could grow on your food and this could result in health issues. 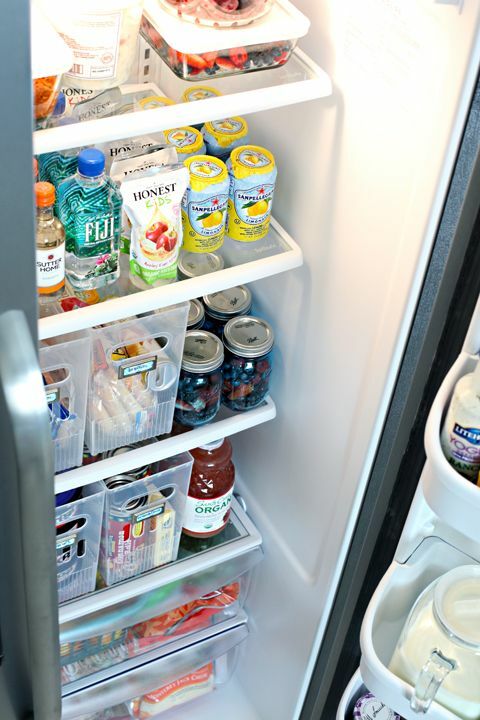 Luckily, keeping your refrigerator neat and organized is not too hard to do. 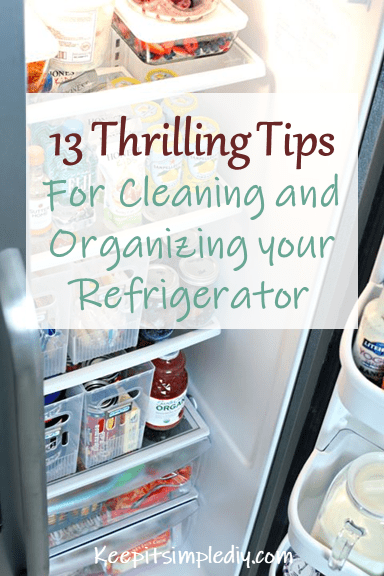 Here you will get 13 thrilling tips for cleaning and organizing your refrigerator. The first step is to thoroughly clean up your refrigerator. Afterward, you can take on maintenance steps to ensure it remains clean. To clean up your refrigerator, take out all the food items you currently have in your fridge. Then take out all your refrigerator shelves and compartment and put them in your dishwasher so they can be washed and clean for usage. While all your food items are still out of your fridge, vacuum it. This might sound funny, but it is very doable. Vacuuming your fridge would take out dried leaves, vegetable dirt roots, wraps and so on. It’s more efficient than when you make use of a wet cloth or wipe to clean out your fridge. Baking soda is very important for cleaning up your fridge, especially if it has some odor. Odors can come from storing raw meat or some food items that elicit smell. To get rid of this, mix baking soda with warm water and wash through your refrigerator. Baking soda doesn’t just keep the smell out, it also helps to clean out stains from the inside the fridge. For more effective cleaning, you can mix baking soda, water and vinegar. After cleaning up your refrigerator, the next step is to return the items back into the refrigerator. To keep your fridge organized, make use of storage boxes. Almost all fridges come with shelves and compartments but there is absolutely nothing wrong in adding some more to keep your fridge better organized. Put similar items in the same storage boxes. This way, when you have to retrieve something from your fridge, you don’t have to leave it disorganized. Labeling storage boxes might seem funny but it is very important. When you label your boxes, it is easier for you to find the items you want in your fridge. It also prolongs the organization of your refrigerator. You can make this labels with sticky notes, masking tapes and markers. Write boldly enough so that anyone who has to take items from the refrigerator can read it. The labels don’t have to go on just the storage boxes, they can also go on shelves. Some of the items to be stored in a refrigerator include oils, vinegar, food dressings, sauces and so on. The original bottles of these items can be quite big so to reduce overcrowding, buy some condiment squeeze bottles. Fill them in, label them and stack them in a section of the fridge. This saves space and looks more organized. It is important to take a look at your refrigerator and know just what part of the fridge should have what item. For example, beer bottles, milk and juice cartons should be stacked up on the door compartments, eggs should be kept in the egg crate and so on. This keeps your fridge very organized and also prevent items from falling or rolling about in the fridge when not stacked in the right place. Cover up the layers of your refrigerator with placemats. This way when there is a spillage, it is absorbed by the placemat and you can easily take out placemats for washing and drying. You can cut the placemats to fit the size of the compartment of the refrigerator. Placemats make your fridge look more colorful and neat while also absorbing spills. One of the best ways to keep your fridge organized is to ensure you don’t buy more products than your fridge can contain. Overstocking your fridge will make it overcrowded and cause difficulty when you want to take out items. When your fridge is too full, it will constantly get messy. Buy the right amount of products your fridge can contain to enable easy access and quick cleaning. You cannot always take out every item in your fridge to clean. Sometimes all you need to do is wipe off spills and stains with a wipe. When there are liquid spills or any kind of stain in your fridge, make use of a baby wipe or soak a towel in water and swipe. Do this constantly to avoid accumulation of stains and smells. When cleaning up your fridge both lightly or vigorously, ensure you make use of disinfectants. The rate of germs forming in your fridge due to the cold is a bit low but one cannot be too careful. Make use of fridge disinfectants that are not harmful to your food items. If you don’t want to go to the store in search of these refrigerator disinfectants, you can search the internet for some recipes which you can use of to make your own fridge disinfectants. Raw meat and cold cut can give your refrigerator an unpleasant odor. This does not mean they are bad or spoilt, it’s normal for raw meat to smell. All you have to do is purchase airtight containers where you can store these food items. Also, put some baking soda in the same compartment as the raw meat and cold cut so that it can neutralize any smell. The interior part of the fridge is definitely the most important part to keep clean but when you are finished, it is advisable that you take out time to clean up the exterior. Simply get a wet cloth with some soap and wipe through. Afterward, ensure you rinse up with clean water. For a stainless steel fridge, clean with mineral oil to make your fridge shine. Putting these steps to practice will not only give you a clean and organized refrigerator, but it will also keep your food healthy and fresh.